Apple will open their newest Apple Store this Saturday at 10 AM in the heart of Glendale, California; a city within the Greater Los Angeles Area. The store resides approximately 500-600 feet away from the world’s first Apple Store – store R001 at the Glendale Galleria Mall. Although the store opens this Saturday, the design, feel, interior, and exterior is yet to be revealed to the public. We have spoken to a proven corporate source in Apple’s retail division that is familiar with the development of Apple’s newest retail store. Externally, the store is slightly different than the Apple Stores we have become accustomed to. The Americana at Brand location will trade the classic silver front with glass doors for an all glass front. That’s right; all glass – Apple’s newish style. In addition, Apple’s iconic logo will float in this glass, similarly to how the Apple logo floats in the Fifth Avenue store’s famous glass cube or the Upper West Side store’s front. The inside of the store features a very open floor plan, that is fairly similar to the chain’s other locations. In all, this Americana a Brand store caps out at just about 14,000 feet. Around 7000 feet of the store is dedicated to the showroom floor, which includes the Genius Bar, tables, and software/accessory walls. This not only makes this new store the largest Apple Store within a mall, but one of the larger Apple Stores in the world. Additionally, there are a few tables dedicated to what we know today as Personal Setup. The catch is, that Personal Setup won’t be called Personal Setup anymore starting Saturday. For this location at least, but we assume the change will carry over to Apple’s other stores. Essentially, Startup Sessions – or more commonly referred to as “Startups” internally – is a rebranding of the current Personal Setup feature in Apple Stores. Personal Setup for iOS devices has been around for a few years now, and Apple added a Personal Setup for Macs program in January of this year. 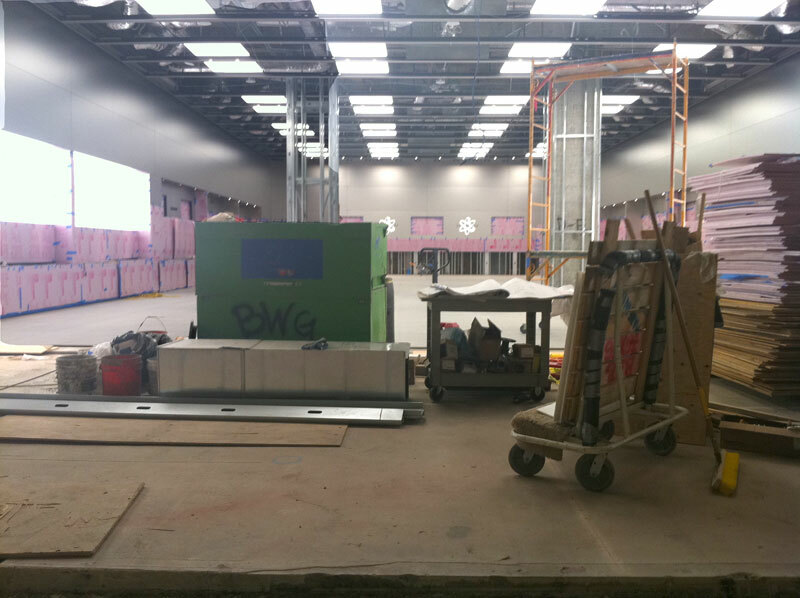 Continuing this Apple Store 2.0 theme, the Americana at Brand location will feature “giant” displays in the metal plated walls and possibly loud speaker systems. The significance of this new Apple Store is not only the closeness to another location, the advances in glass engineering, and its size, but because it is Apple’s first true “Apple Store 2.0.” Like we exclusively reported in May, Apple Store 2.0 is a gradual revamp of the Apple retail experience. This includes the iPad Smart Sign, Startup Sessions, more interactivity, and new monitors and possibly speakers. The Apple Store at Americana at Brand will open with all of these features; making it the first Apple Store 2.0.